As a Jisc member, it can make business sense to offer internet access to members of the general public who don’t have links to research or education – whether in areas such as cafes and cultural spaces, or at business-critical occasions such as open days and outreach events. The process of finding the right supplier, however, can be a challenge. With many different wireless providers available, and potential concerns to address about GDPR compliance, approaching them all individually can be a drain on resources. To address this issue, Jisc offers a dynamic purchasing system (DPS) for public wifi, designed in a cost-effective way that makes the most of the Janet Network. The service allows you to submit your detailed requirements, and receive several quotes from competing bidders – helping you meet your needs while achieving value for money, and avoiding the hassle of running a local procurement. How can the purchasing system help you? 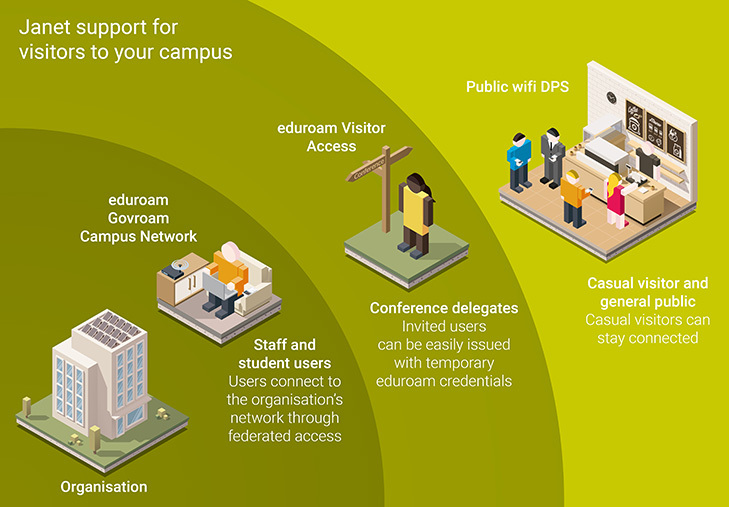 Having the right public wifi solution enables you to offer good-quality connectivity to the public – including prospective students at open days. Connectivity at open days has been cited as a decisive factor in choosing a university, so this could boost student recruitment. Make the most of existing infrastructure. Because suppliers can use the Janet Network for backhaul to the wireless provider’s network, they don’t have to provision a separate broadband circuit – and can pass savings on to you. Save time on procurement. At Jisc, we pre-qualify the suppliers on the DPS. So by using the DPS, you save on the time and money you would have spent approaching suppliers individually. Foster competition. By encouraging suppliers to bid against each other, the DPS helps you achieve a competitive quote and keeps service standards high. The service also helps reduce business and legal risks. Get peace of mind on GDPR. Suppliers on the DPS are pre-qualified as providing a GDPR-compliant solution. That said, members are free to negotiate with suppliers to offer a solution that carries GDPR implications – for example, when gathering personal data to follow up with visitors after an event. Comply with the Janet eligibility policy. As a condition of allowing wireless providers to use the Janet Network for backhaul, we require suppliers to encrypt end user data. That way, public data and research/education traffic stay separate, ensuring compliance with our usage policy. Avoid obligations arising from offering public access. Suppliers typically assume the legal obligations that arise from offering public internet access, which could be onerous if they were to fall on you. As the DPS allows you to submit detailed requirements and receive quotes, you can be flexible about your needs – and choose a supplier who can meet them. You then agree a contract and price separately with your chosen supplier. Because the DPS is dynamic, it means suppliers can offer product and technology innovations immediately. Suppliers can offer you additional services under the DPS that make use of the fact that backhaul traffic is encrypted. These may include footfall tracking, security remediation or device auto-configuration. We provide documents to help you use the DPS – such as a buyer’s guide (pdf) and a sample invitation to tender (Word doc). To find out more, please contact your Jisc account manager. Alternatively, contact mark.o’leary@jisc.ac.uk.